Will Battleborn be more than Borderlands by another name? We got our hands on Battleborn at this year's PAX, the newest FPS from Gearbox Software. 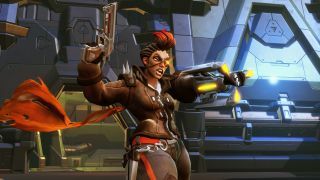 With its cel-shaded art style and RPG-ish approach to character progression, the biggest question is how it will differentiate itself from Gearbox's already popular Borderlands series, let alone all the other shooters on the way. Tyler took control of Thorn, an archer character, while Evan used a knife throwing mushroom named Miko who also has healing abilities. You can watch the video embedded above to get their impressions, while the video below is a full 20 minutes of gameplay at sugar sweet 60 fps.